Do you occasionally have dreams and visions–or even strange things that happen to you–and you just know that God is speaking … but you have no idea what He’s saying? Understanding dreams and visions is a hot topic because God truly does speak using dreams, visions, pictures of many kinds, and strange events. A huge portion of the Bible is made up strictly of the writers recording the dreams and visions God gave them! So how can you understand dreams and visions? With the help of the Holy Spirit. Dream interpretations belong to God! By studying the Biblical meanings of symbols and dreams. God is the only one who can help you understand what He is saying. The good news is: He’s eager to do so! If you’re eager to learn, He wants nothing more than for you to understand the personal love letters He sends you in your dreams and visions. So if you want to understand dreams and visions, where do you start? Whenever you have a dream, the most important thing is to write it down as soon as you wake up. Don’t think you’ll remember it later; you usually won’t. So grab a notebook and write down everything you can remember. In particular, there are 10 key elements that are VERY IMPORTANT, and you’ll need to keep careful record of those elements. 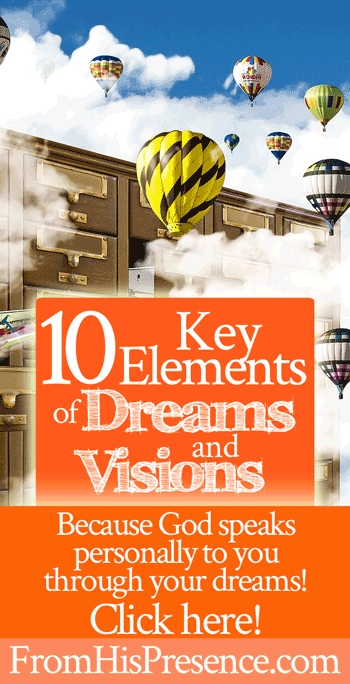 I listed the 10 key elements of dreams and visions below briefly. However, I was inspired to do a more in-depth teaching on it this morning, so I also recorded a video for you! 1. If this dream, vision, or event were a movie, what would you title it? The title helps us figure out the main point or direction of the dream for you. 2. Is the dream in color or black and white? Dreams in color vs. black and white have different applications. 3. Any colors you see in the dream. All the colors have meanings. They have one meaning if the color is used in a positive context and another meaning if the color is used in a negative context. Colors are a huge key to the meanings of dreams. God speaks using numbers all the time. When you see specific numbers in a dream, it’s often a huge sign about what season of life you’re in (or what new thing you’re about to experience). 5. Things that happen (or that you have) on your left vs. right side. Left means one thing and right means another. Left vs. right often show us whether something is currently happening or about to happen. Each of the body parts has a different symbolic meaning. They can describe relationships, skills, talents, personality characteristics, and more. Names have meanings. When you see someone in a dream whose name you know, but you don’t know that person in real life, it’s often because the meaning of their name is important in your dream. The name can be important if you do know the person, too. 8. Relationships (acquaintance, stranger, mother, etc). A dream about your mother might not necessarily be about your mother. Sometimes the meaning is symbolic. 9. Did you see a character’s face, or not? Sometimes this helps us tell if the dream is about an actual person or situation, as opposed to being symbolic. 10. Is the house/place you saw in the dream the same as it is in real life? If not, how is it different? This is a big key because it often tells us if a dream is symbolic or literal. It also can sometimes tell us if you’re about to transition into something new in your life. God speaks to His people using dreams and visions. And if we learn to understand His voice when He speaks in this way, we open a treasure trove of communication with the One who knows us best and loves us most! Did this vlog help you or pique your curiosity? Leave a comment below! I’d love to hear from you! Thanks for watching! Glad it helped! Good! 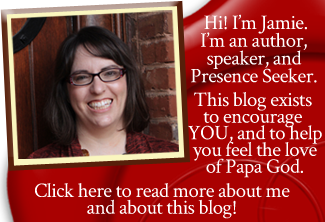 Don’t lose out on the love letters God is sending you! Thanks so much for this topic, Jamie! I’ve been having very vivid dreams with my departed dear grandmother in it since my mother’s birthday almost two months ago. My mother by the way is in my home country in real life and in my dream my grandma came over wanting to attend the party getting herself ready like she used to in her wheelchair even if we both knew in that dream that she had already departed. Quite a number of times she appeared in my dreams succeedingly, where she would console me, express concern with what’s going on in my life, and gave that feeling of comfort. I just interpreted these as my own wish fulfilling dreams of my desire for her comfort and assurance like when she was alive and thanked God for His love through those dreams. But there could also be more about them. The last one I recently had was about her and her also departed best friend. My grandma was at my left side the whole time, doting me while she was being like a “posh grandma” wearing beige stilletos and a bejewelled glittery jacket with the colors of a predominantly green parrot. I too was wearing a jacket in bold colors of red and blue but in a casual design for younger people, and in my sneakers. She was quite simple in real life but liked to dress sensibly, only wore stilletos when she was decades much younger. It was her best friend who dressed posh as a senior and very put together in real life. We were walking through what looked like an italian palace with all those sculptures around the stairs, etc (only saw those in movies & tv). I asked her why we were there like she was attending an award show or something, and she answered because it was the govt city hall and senior people need some things from the city hall. I was enjoying our walk down those palatial stairs, until she disappeared to join her best friend to go down to an unfinished/abandoned part of the palace where it was mostly gray/unpainted concrete. I looked for her there but didn’t see her anymore. The gray colored old people along the gray stairs told me I was not supposed to be there and must find my way out. So ok I went to find a way out, thinking in my dream that it must be because that place must only be for dead people. I woke up knowing I got out of there but wishing to have seen and felt my grandmother more in that dream. Thanks for reading this comment, Jamie.? Hopefully there will be a sort of Biblical glossary/index on the significance of dream symbols that you mentioned and where to find them in the Bible. God bless your ministry & family. Love this teaching! Excited to listen to the MP3s. Thanks Much! Excellent material. So looking forward to learning more. I had a dream recently where a preacher was teaching but venue was very top castle turret which was open to the sky and near the sea. The audience was seated only around the edges. He was talking about ” glazed eyes”. He then walked over to the left to his wife and took her hand saying” I have never looked at my wife with glazed eyes”. Then he and his wife walked off together hand in hand.